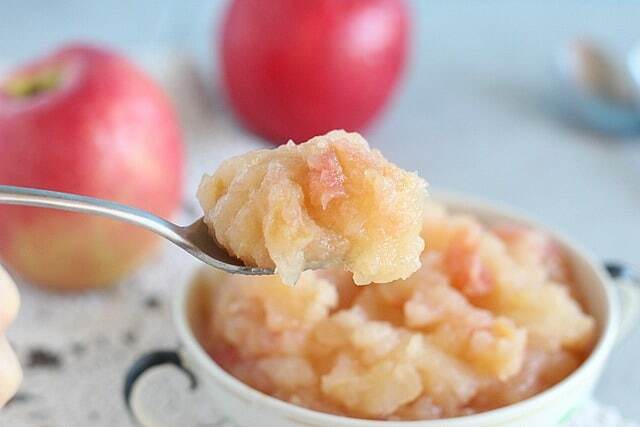 This easy recipe takes the guesswork out of making applesauce in your pressure cooker – made simply with organic apples and water, NO added sugar! I tried a stove top version a couple of years back, but ultimately determined that: A) it was too much work, and B) I wasn’t saving much money with my concerted efforts. Recently, however, I’ve been eating and craving applesauce like a madwoman, going through jar after jar. My go-to brand has been Trader Joe’s organic applesauce (ingredients: organic apples). It has served me well, but given my recent bender, I’ve found there’s a rather distinct quality difference between jars. This discovery led me to try a couple of other brands, including Whole Foods 365 and Santa Cruz. Whole Foods was ‘fine’ and comparable to Trader Joe’s, cost-wise. Santa Cruz has added ascorbic acid and is more expensive. I won’t eat brands with any other additives, such as sugar or citric acid, so many companies are out for that reason. 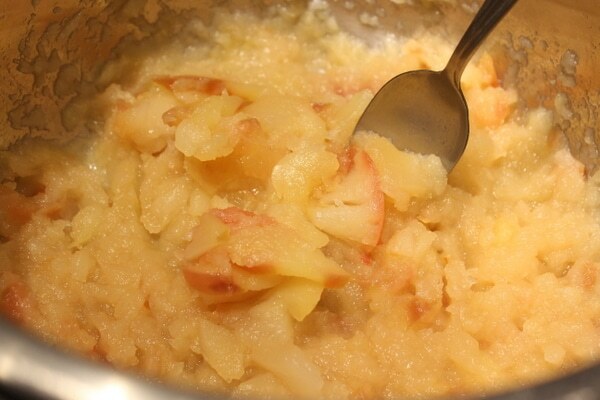 What’s changed my mind about homemade applesauce has boiled down to one, all-mighty device: The Instant Pot! 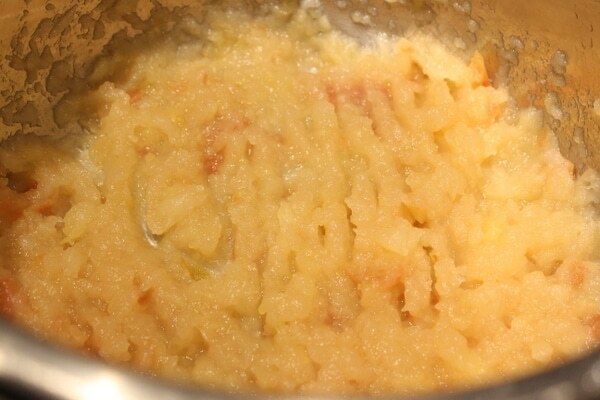 Because of the hands-off nature of this modern convenience, making applesauce has become easy as…pie!…which is actually not easy, ironically, but youknowwhatimean. 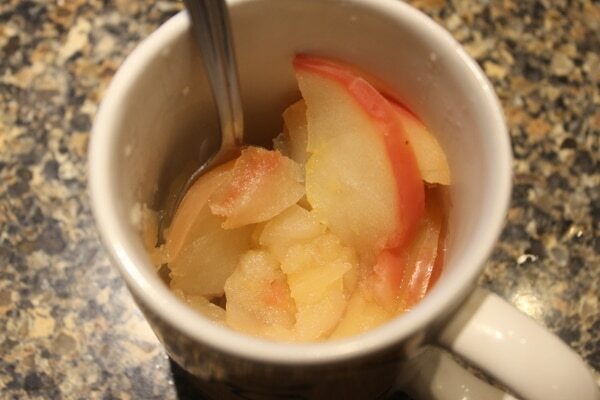 I love being able to make applesauce out of whatever apples I like, as well. My favorites are the crisper kinds, like Pink Lady and Fuji, as they hold up well, lending a more toothsome bite. I am not one to prefer super smooth sauce, though you can blend this to your heart’s desire. I personally like a good amount of texture. TO PEEL OR NOT TO PEEL…? 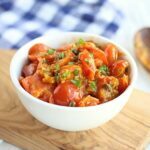 The apple peel can lend a chewy texture to your sauce, which I enjoy, but if you’d prefer to leave it out, that works too. 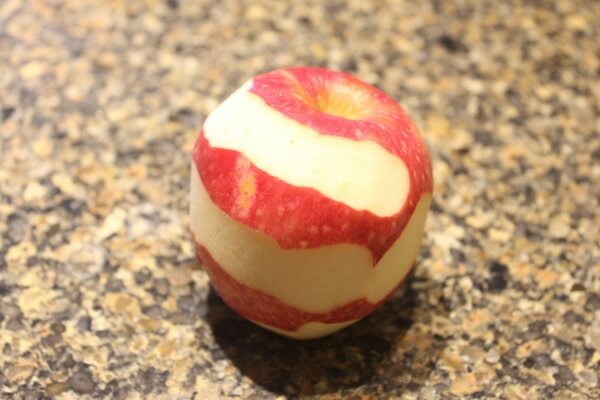 I actually peel the apples halfway, leaving a little chew, but not too much. 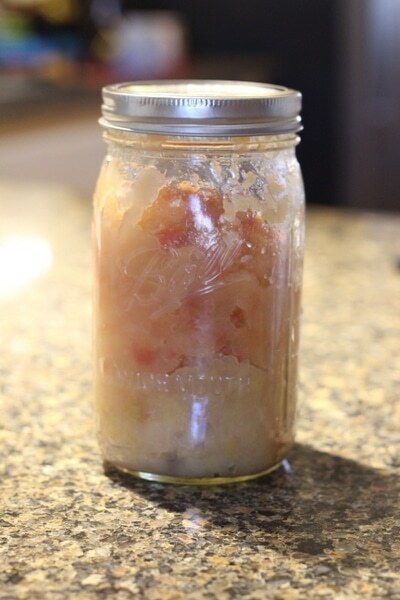 I like to keep my applesauce as simple as possible….organic apples and water. No lemon juice, no cinnamon, no added sugar…nada, nil, nichts! Given that apples are high on the list of ‘dirty’ produce, I would always invest in organic apples. If it’s a tight month, and you do buy non-organic, at least wash and peel them completely. Pesticides is nasty! 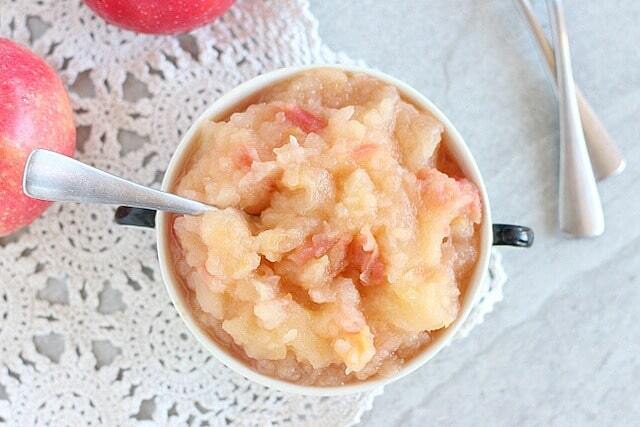 WHAT TO DO WITH YOUR APPLESAUCE?? Well, obviously, you can eat it straight, give it to the kiddies, make applesauce popsicles…but I’ve also been employing it in various recipes. It adds a nice, natural sweetness to soft-baked goods like muffins. I’m actually hoping to have a new muffin recipe for you soon using it! 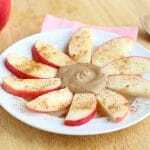 This easy recipe takes the guesswork out of making applesauce - made simply with organic apples and water, NO added sugar! Peel the apples to your liking. I take off about half of the peel (see pictures below). 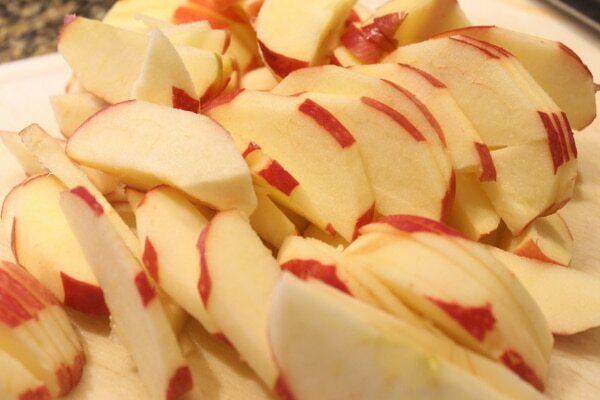 Slice the apples around the core, then, lay the flat side down and continue cutting into thin slices (see below). 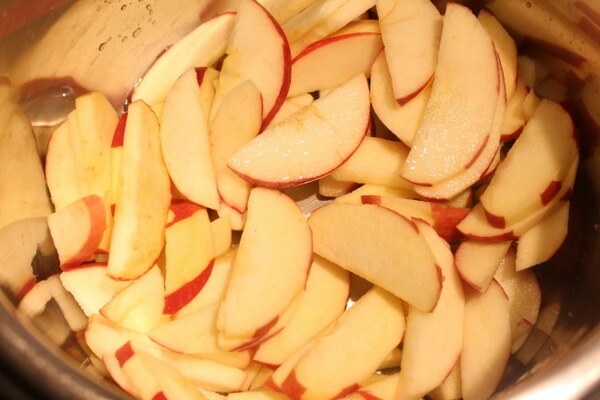 Add the sliced apples and water to the Instant Pot. Set the Instant Pot to high pressure for four minutes. Once complete, let the pressure manually release for 10 minutes (the display will read LO10). In other words, don't touch the pot for 10 minutes! 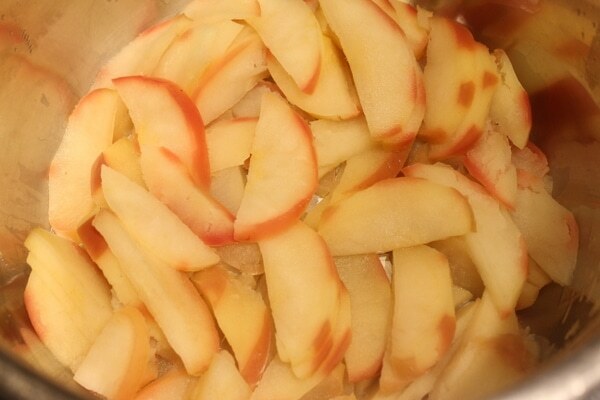 Then, mash the remaining apples to your liking (I just use a potato masher). 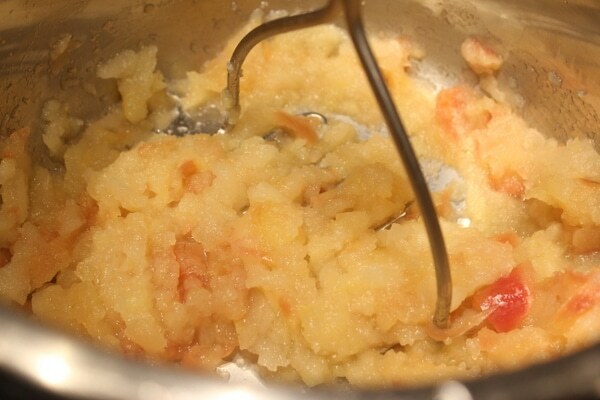 Add the reserved apples back and give the applesauce a stir. 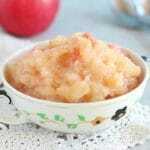 Allow the applesauce to cool and store it in an air-tight container in the fridge (I use a mason jar). 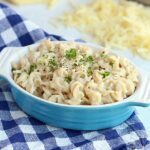 I like to use Pink Lady or Fuji apples for this recipe. 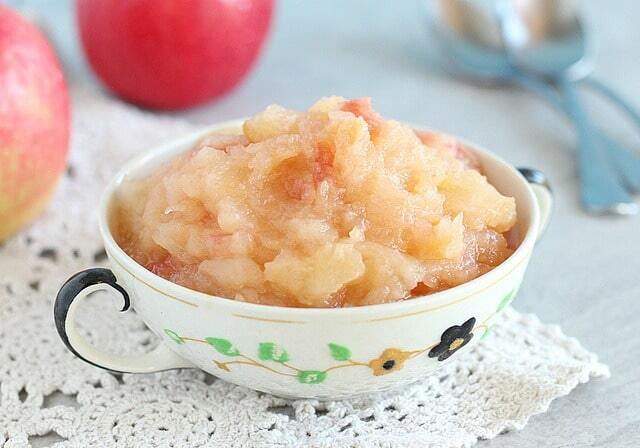 This recipe makes about 2-3 cups worth of applesauce.